I've posted my review of the LG Optimus M. Despite having played around with Android smartphones since the initial HTC Hero, this was actually my first time truly spending a LOT of time using the Android OS. I used the phone as my daily smartphone for close to a month, and got quite familiar with its usage. 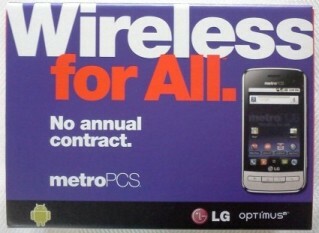 It was actually a little painful to return the loaner unit to MetroPCS! - My first impressions of the LG Optimus were that it has a very high quality fit and finish making it feel very high end, even though it's positioned as a mid-tier smartphone. - While the hardware buttons on the front are of good general quality, and have a nice tactile feel, I much prefer the touch buttons of other smartphones, which make navigation feel much zippier. - There's no external LED indicator light, which I feel is a major design flaw. I don't want to have to turn on the phone to know whether I've missed a voicemail, email, or text message. - The LG Optimus M shipped with Android OS 2.2, which was the latest Google OS at the time; it's got some nice features that I enjoyed using. pre-installed, and I think generally speaking people will find it confusing to know which mail and navigation app to use (for example). - The screen was bright and vibrant despite not being the highest quality touchscreen currently available; I had no complaints here. - While the virtual keyboard was easier to use than other smartphones I've used/tested, I'm still having a lot of difficulty transitioning to a virtual keyboard after almost 8 years of using a physical keyboard (ex. BlackBerry, Palm Treo, Palm Pixi, etc.). - Swype was fun to play with, however, I found it slowed me down because my fingers were constantly in the way of my view when scanning for the next letter. - The camera was reasonable quality for 3.2 megapixels, however, without a flash outdoor pictures were the best bet. Shutter lag made it a little difficult to capture those priceless moments of my fast-moving 2-year old son. - Performance (app loading and screen rotation) felt quite zippy, and were particularly good considering that it's only a mid-tier phone. Overall I found the phone to be a pleasure to use (my frustration with virtual keyboards aside), and I think that MetroPCS and LG did a great job with the LG Optimus. Click over to read my full review of this LG smartphone and MetroPCS' service, or feel free to share your thoughts and opinions below. LG Optimus Now Has A Slider! I agree that this is a decent smartphone. For a mid-range smartphone it's actually quite capable. For those who just don't like the virtual keyboard, Virgin Mobile now has the LG Optimus Slider, which is a great option. I haven't had a chance to try it yet, but thought I'd mention it because it's often one of people's first objections when I talk to them about smartphones. Now you can basically have the same phone with or without a keyboard!